Khrystyna was born in the small town of Chortkiv in Ukraine, close to the mountains where her family spent many happy summers. Her early memories flooded with the beauty of nature, surrounded by rivers, lakes, mountains, caves, old towns, castles, and the rich historical and cultural past of her native country. When she was small, her mother observed that she always loved to stare at the colorful threads at the local market and had a passion for bright colors, especially lime-green, which was a magnet for her. Khrystyna’s grandfather taught her how to draw horses, and she would sit on his lap while he would draw. He had been so gifted as a child, that he had drawn portraits and exchanged them for home goods in his village at age 10. This talent clearly carried through the generations. As a child, Khrystyna’s talent was also so strongly evident that her mother let her paint murals on the family’s kitchen walls. As a teacher, she knew this would cultivate young Khrystyna’s talent, and the kitchen murals were her proud spot for years. Khrystyna Kozyuk – by 5th grade, at age eleven, Khrystyna’s “Birds” series began selling successfully to tourists in her city. Volodumur Krynuckuj, a local teacher, took notice, and urged her to enroll in several art competitions, where she won multiple prizes, including 1st Place in an international children’s competition in Poland. The prize was a vacation for one week in Krakow and attendance at a variety of advanced art workshops. It was there that Khrystyna had a chance to visit Wawel Royal Castle, and the huge canvases of Jan Matejko, which made the final impact on her decision to attend art school. Khrystyna entered and thrived at National Wood Technology University in Lviv for Interior Design, where she took Classical European academic drawing classes. During her studies, she relished living in Lviv, the art capital of western Ukraine, and adored its architecture, museums, and art school environment. Upon graduating from University, Khrystyna moved to the United States in 2005. Like many immigrants, she started from nothing, without formal English training, and no family nearby for support. During these early years in the U.S., she stopped painting in order to sacrifice and survive. She earned a living cleaning offices and studied English at a community college in order to save money for art supplies while learning to adapt to her new homeland. In time, however, her hard work paid off, and Khrystyna soon began studying Interior Design at Triton College. Khrystyna has chosen to devote her life to art as service. 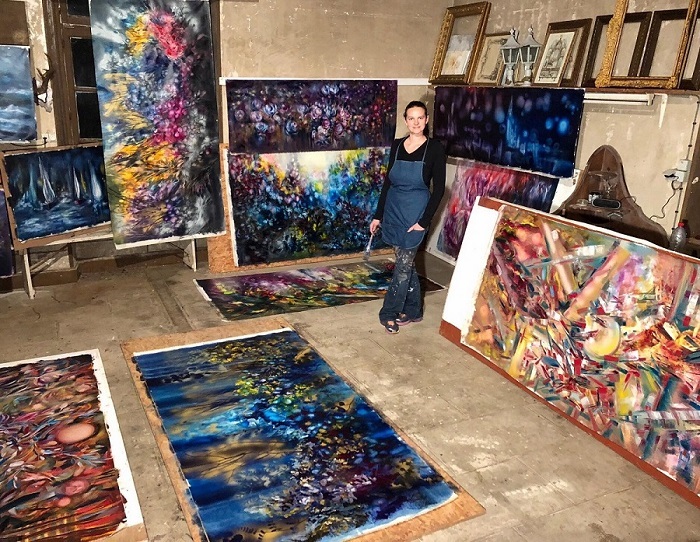 Whether through painting, art therapy, or creating and transforming cold, lifeless environments with mixed techniques and materials, her art is intended to be recreational therapy to heal the stressed human condition. Her creativity knows no boundaries, and often keeps her awake at night because she is so inspired with ideas to share. Whether through paintings or interior design, Khrystyna’s lifelong talents and gifts continue to delight audiences and make the world a more cheerful and beautiful place to live in.